Father David Bauer organized Canada's first national hockey team as a group of athlete scholars. They were jobbed of a medal at the 1964 Olympics, but won bronze in 1968. Below: Roger Bourbonnais as a skater in 1964 and as a lawyer in 2010. Roger Bourbonnais twice played in Olympic hockey games for a gold medal. That he has a single bronze medal to show for his effort reflects the fortunes of sport, as well as the duplicity of officials. Mr. Bourbonnais has worn the maple leaf on his chest and he has faced Finns, Czechs, Swedes, Americans, and Russians on the ice. He knows the burden of carrying his country’s hopes in the one sport that matters more than any other. That he did so as an amateur, as a university student, sent out to confront a mighty Soviet team, seems ever more remarkable as the years past. Mr. Bourbonnais, 67, a lawyer in Vancouver, was recruited out of junior hockey in 1963 to play for a squad being organized by Father David Bauer, a Basilian who had abandoned his own prospects of a professional career for the priesthood. Europe’s best had been dominating the senior Canadian teams sent overseas, so Fr. Bauer convinced Canadian authorities to allow him to forge the country’s first true national team. He wanted young man of strong moral fibre, athletes who would continue their studies even as they prepared for the Olympics. The players lived on the University of British Columbia campus, where Bob Hindmarsh had purchased the prize home from a lucky fairgoer at the annual Pacific National Exhibition. The house was trucked to the campus. Mr. Bourbonnais remembers hammering a nail into the wall as a place to hang his clothes. The squad attended class during the day, held a practice at 4 p.m., ate supper together in the house. (They had a cook the men referred to as Ma.) Then, they pounded the books late into the night. Mr. Bourbonnais was a smooth-skating centre with good hands. He stood just 5-foot-9, weighed 170 pounds, small even by the standards of the day. In retrospect, the notion of amateur student scholars taking on the world’s best hockey players seems folly. The Czech and Soviet players were professional in all but official status. 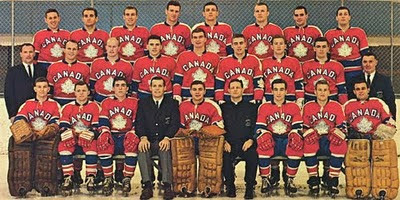 The Canadians were shellacked in their first European exhibition game in preparation for the 1964 Winter Games at Innsbruck, Austria. While some thought they were about to be crushed in the Olympic tournament, Mr. Bourbonnais said the defeat and an us-against-the-world mentality, coupled with a discipline instilled by coach Bauer, helped the young squad come together as a team. “We always had the faith that we could do it,” he said. In Canada’s final match, the unheralded Canadians rode goals from George Swarbrick and Bob Forhan, nursing a 2-1 lead late into the second period against the mighty Soviets. The winner would get gold. The Soviets tied the game at 18:28 of the second, then popped in a goal at 1:36 of the third period for the lead. The Soviets won the game to take the gold medal, while the Canadians finished with a 5-2 record for a three-way tie for second with Sweden and Czechoslovakia. Under the tie-breaking system in effect, the Canadians believed they had claimed the bronze medal. They marched back into the stadium that evening dressed in their official blazers, only to discover that the International Ice Hockey Federation officials, led by Bunny Ahearne, never a friend of Canada, had agreed with the Europeans to alter the tie-breaking system. The Swedes would get silver, the Czechs bronze. The sense of unfairness lingers nearly a half-century later. “I think we got jobbed,” Mr. Bourbonnais said. The hockey program moved to Winnipeg, Fr. Bauer becoming team manager and replaced by Jackie McLeod as coach. Mr. Bourbonnais was studying law at the University of Manitoba. A friend, now a judge, mailed overseas carbon copies of lecture notes taken in class. The Canadians still struggled to score at the 1968 Games at Grenoble, France, despite the presence of slick Fran Huck, but the team managed to qualify for a gold-medal showdown once again against the Soviets 42 years ago today (Feb. 17, 1968). The Soviets eked out a 2-0 lead after two periods though outshot by the hardworking Canucks. The Soviets popped in three more in the third. As a consolation, this time the Canadians received their deserved bronze medals. That was the end of Fr. Bauer’s dream, as the country withdrew from the Olympics, not to return until 1980. His players, many of whom earned university degrees, a few of whom played in the National Hockey League, went about their lives. The rink built on campus for the the team has been replaced by a new facility constructed for the Olympics. Mr. Bourbonnais, who was named to the IIHF Hall of Fame in 1999, had a modest role to play in the leadup to the Games. In the dress rehearsal for the Opening Ceremony, the lawyer was asked to take part in the pretend Parade of Nations. He was an ersatz Swiss. As for his bronze medal, his six-year-old granddaughter is taking it to show her classmates in a Coquitlam elementary school this week.